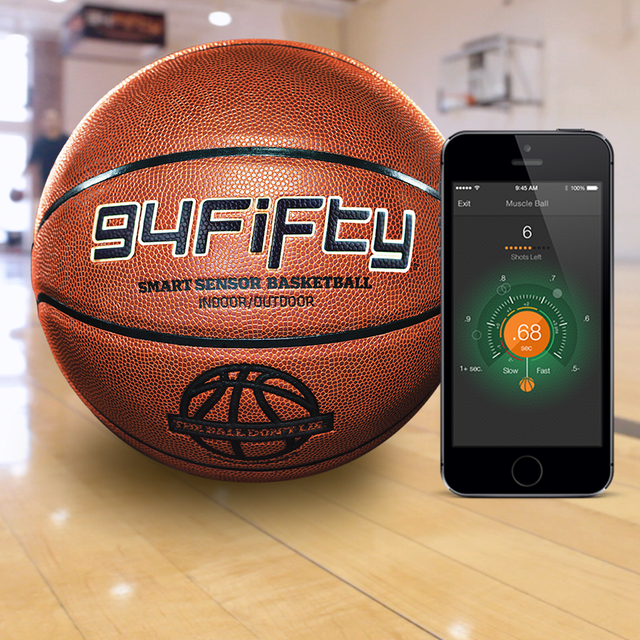 The 94Fifty Smart Sensor Basketball and 94Fifty app on your iPhone, iPad, or iPod Touch measures muscle activity, so you can understand your playing strengths and weaknesses. It adapts as you improve, while providing basic, intermediate, and advanced level training to help you quickly build better shooting and ball handling skills. It’s like having the best coaches in the world with you every day of the year. Regulation ball with free downloadable app. Instant feedback: Visual and audio voice feedback comes within milliseconds on every shot and dribble. By paying attention to this instantaneous, completely unbiased data, you can quickly learn how to adjust mechanics or address flaws. Now anyone in the house can become an expert trainer. Adaptive workouts: The app adjusts as you improve and increases skill difficulty from playground up to pro level. Start at the Playground level and work through a choice of ball-handling, shooting, or total player workouts. Each level adds new drills and more difficult metrics to move onto the next level. Develop your own skills at your own pace: Whatever skill is most important for you, 94Fifty can measure it and suggest ways to improve. The free app can count dribbles, dribble force, shot release speed, shot arc, and backspin. Head-to-head competition: Automated, real-time scoring and leader boards determine the winner for up to five players. Pick from four different competitive games, then choose from up to 50 drills to see which player has the best skills. See who can get the most dribbles in 20 seconds, or earn bonus points for who can dribble fast with dribble power. Shooting competitions give bonus points for shooting with better shot arc or faster shot release speed. Current leader boards display winners and historical win-loss standings. See your progress: Track daily and all-time bests. Sets goals for more than 50 drills and competitions. Let small successes every day lead to long-term achievement. Bluetooth connectivity range up to 90 feet (30 meters) between iOS device and ball. Dribble the ball a few times to activate; the ball puts itself to sleep when there’s no activity. Shot Arc Analyzer helps you learn to shoot with a more consistently ideal arc. Shot Release Speed Timer lets you increase scoring opportunities by keeping you aware of game speed. Shot Backspin Analyzer improves accuracy by developing your wrist for better follow through and a shooter’s touch. Dribble Power Meter teaches you how to dribble harder under pressure with either hand. Wireless rechargeable battery sits easily on the charging pad; blue light indicates activity. Rugged, weatherproof, indoor/outdoor synthetic leather skin.